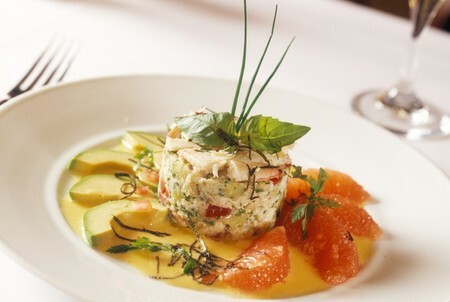 Innovative American food is the signature cuisine for Wright’s at the Biltmore. Chef de Cuisine Connor Favre has developed a new food concept called “American Lodge Cuisine” which incorporates rich textures and bold flavors with fresh seasonal ingredients. This restaurant is part of a historical landmark created in 1929 and shows off an art-deco style inspired by renowned architect Frank Lloyd Wright. Its appearance is elegant, detailed and intimate. A pre-fixe menu is available and changes daily. Some of the dishes are Large Striped Prawns with mustard greens, lemon risotto and Arizona citrus sauce and Seared Red Trout with root vegetable ragout, mustard potato pasta, chardonnay butter and American caviar. Wells Fargo-Council dinner on Wed, Sept 29, approx. 12-14 attendees, need private room. Check out Wright's and Quiessence. Both restaurants have private dining rooms. Beautiful property! We were seated overlooking a small courtyard - through which housekeepers constantly traveled pushing mops and carts! Fish in a bowl? Waiter was very competent, but a little too chatty for my taste. He wanted to converse about the real estate market in Phoenix; interesting, but detracted from my meal experience. Food was very good; I had squab and wife had beef medallions. Souffles for dessert. Competent but not particularly exceptional offerings. Extensive wine list at Biltmore prices. Overall a good but not sock-losing experience. If you're staying at the Arizona Biltmore there is no reason to leave the premises. New Year's Eve at Wrights was perfect !! After fighting our way through a crowd at the overflowing bar, we were greeted by a hostess who did not even look up from her computer screen. We gave her our name, which she located in her list. She then said that she did not think that they accepted reservations from PhoenixRestaurants.com even though she clearly had our name. We stood there as she looked around for an answer. Finally a managerial-looking young man rushed over and attempted to get us seated over the continuing protests of the hostess. After that, things did not improve. The wine list could be duplicated by any supermaket. The food was generally good, but nothing was exceptional. The service was also good, but unexceptional. Finally, the setting became oppressive. This was our first visit to the Arizona Biltmore, and we found the decor to be too dark and depressing. We were glad that we were staying elsewhere. We consider ourselves overcharged for the experience.